This page is dedicated to the CMSM collections and I would like to thank them for their moral support and willingness to share their knowledge of Fairbairn~Sykes fighting knives. Some of the photos in this section will not be quite as clear due to the nature of the items being in cases or framed. It is my hope that as time allows we can get clearer images of some of their extraordinary knives. They are also currently in possession of the Peter Mason Collection and it was through my continuing search for the good Captain that I became aware of this splendid museum. Everything posted on this page is to their credit and with my sincerest appreciation. Any mistakes in the descriptions are mine. In the following photos you will be treated to the personal knives from Capt Peter Mason and other Fairbairn~Sykes knives. These alone, ought to be sufficient to cause you to seek out this museum, but you will find much more to encourage you to spend a day perusing their collections of arms, uniforms and other military memorabilia. Shown right: Illustrated to the right are two "teasers." The knife in the left column (referred to as a "Metford FS") is a 3 inch guard first pattern with an nicely formed blade made from a Lee-Metford bayonet. The handle has a slightly different shape to the pommel, more elongated and less bulbous. In the right column is a more common second pattern. Presently the museum collection contains a total of fourteen commando knives. In the coming days I will be sharing information and stories on some of the knives, as provided by the staff of the museum. who have interviewed many of the people involved with F~S production, and veterans who carried them. Below: Here is an interesting and extremely rare "Shanghai Dagger" from the CMSM collection. Right: Shown to the right is a photo of personal items from SAS Capt. Peter Mason's "spy" memorabilia. Capt. Peter Mason's exploits were the inspiration for some of the James Bond series of novels and movies. Below: Illustrated here is a beautiful example of an X-dagger. The knife's blade was ground from the tang portion of a Lee-Metford bayonet and the "thumb dagger" was made from the tip of the same blade. A nicely constructed sheath houses both blades. Note that the sheath was designed to be worn handle down, suspended from a button. The retention straps are designed to ensure the knives cannot accidentally drop out. Illustrated below: Some of the F~S collection, L to R: first pattern, std second pattern, nickle second pattern, wood handled, beaded & ribbed. Below (L to R): More of Peter Mason's personal knives. The left knife is a "suicide" style with screw-apart handle which reveals a compartment for a cyanide capsule. It is another "Metford dagger" made from a bayonet blade. Center is a rarer form of the second pattern sometimes referred to as a "button hilt." The knife on the right is a fine example of a "Beaded and Ribbed" knife. At the bottom is an Arab Jambiya knife and sash. Below: Late reproduction of the USMC Stiletto by Case Knives. Below: On the left are two miniature "Agents Daggers." There are some people of the opinion that the miniatures were repaired standard knives whose blades had been broken, or post-war window dressing, or salesmen's models. It is obvious from the photo that these are not any of the above and were made for operatives who needed a more concealable knife. In the lower right corner can be seen some "lapel & thumb daggers" reportedly issued to SOE and other agents. Below: William Cassidy, with the permission of the Fairbairn family, formed a company called Castle Knives and financed the production of a limited number of these excellent daggers. 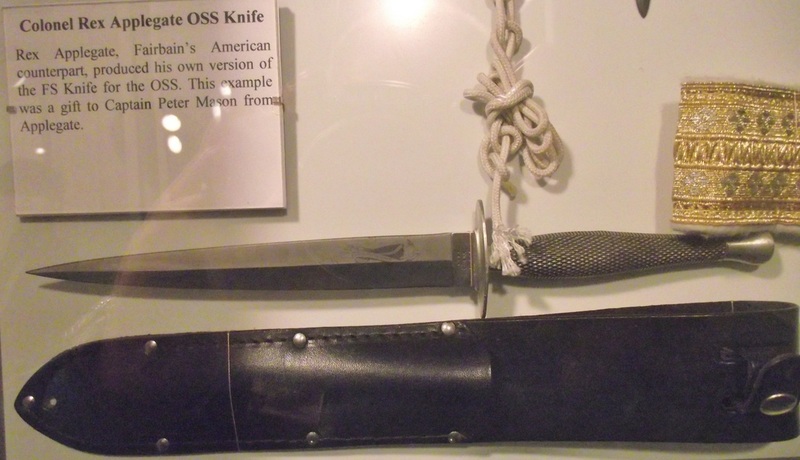 In some ways these knives are closer to the OSS dagger than an F-S. Portions of the sales proceeds went to the Fairbairn family, who never received any monetary compensation for perhaps the most famous fighting knife ever designed. This is Peter Mason's personal Castle knife given to him by William Cassidy. More information on these knives can be found on the post war knives page. Below: shown below are two very unique Wilkinson Sword Co. knives from the Peter Mason collection. This is the only Third Pattern Fairbairn ever made by Wilkinson Sword with a wavy guard, no less a three inch one! who says, "never say never?" Following: This is the last Second Pattern produced by Wilkinson Sword Co. Note the major change to the shape of the pommel. It is more lozenge shaped rather than the traditional rounded knob. The museum placards more fully describe the knives.